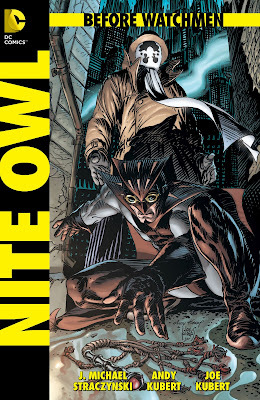 Before Watchmen: Nite Owl #2 (of 4) - "They run. I like it when they run. But not as much as HE does." 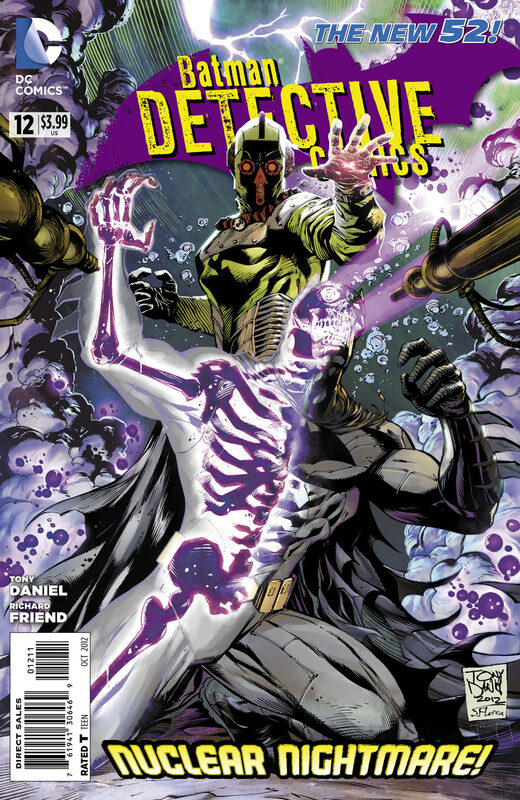 This issue, we get to see a lot of Nite Owl and Rorschach...how they work together, what their own personal boundaries are, and what they DON'T agree about. We learn a little about BOTH of their own "personal issues" so to speak, all in a context of bloody murder, domestic violence and prostitution. Things which both Nite Owl and Rorschach are all too familiar with, and not just in their roles as masked heroes. The best part of this comic are the flashbacks to childhood we are treated to, both of Dan's childhood and of Rorschach's...it's nice to flesh out their motivations...not that they needed more reasons to be grim in the Watchmen universe, but still...fascinating issue! 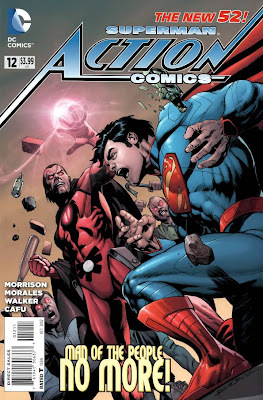 Join me for Action Comics, Detective Comics, Earth 2 and more after the JUMP! Action Comics #12 - Adam "Captain Comet" Blake is trying to kidnap/"rescue" Lois Lane's niece, who, like him, has extraordinary mental abilities. Of course in doing so, he has managed to quite carelessly badly injure Lois! 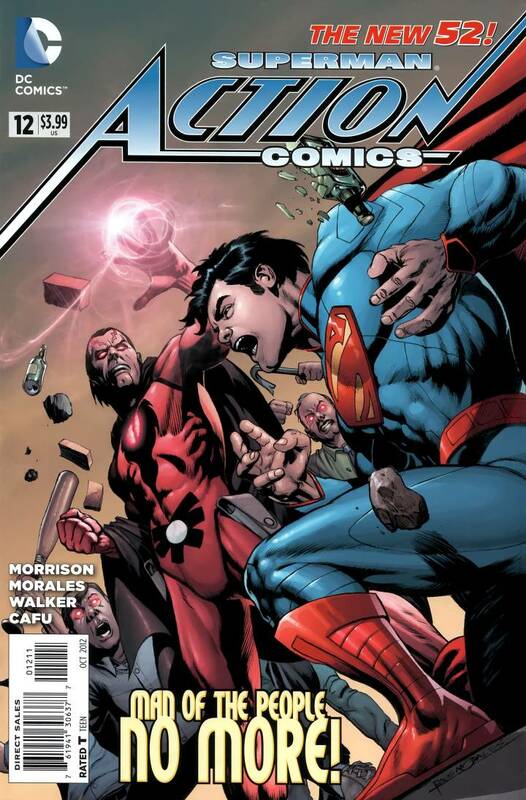 Superman's not letting THAT stand!! Turns out Blake was born not far from where Clark himself grew up and is conveniently responsible for the rumours of a super being in that area, covering up for the strange goings-on at the Kent farm...he actually was born just as Superman's ship was landing on Earth, making it at least theoretically possible that their powers are in some way connected. However, Blake also has a connection to some weird blobby aliens called "Oort-Kind". 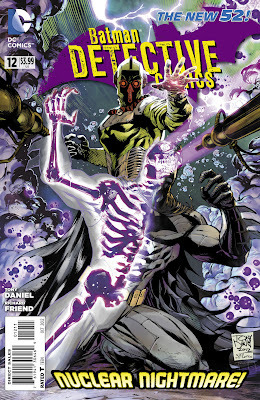 Detective Comics #12 - Batman's still working on foiling the plans of the cartoonish radioactive super-villain Mr. Toxic this month! Lots of science and detective works as Bruce has to piece together who this guy is, where he comes from, what he wants and hopefully how to stop him! A strange pen-like recording device given to him by a homeless man provides the only clues...but will it be enough?? There's some really cool shots of Batman in a modified bat-suit this issue which includes a Bat Wing-like jet pack and a face mask, presumably to counter radiation. It looks awesome! 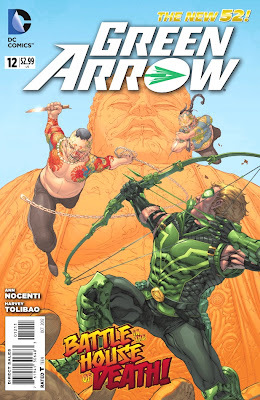 Also, we get a tiny back-up story about Harvey Bullock, a rookie cop named Nancy and the Joker's face...teasing the return of the Clown Prince of Crime this October. That twisted, evil fiend!! 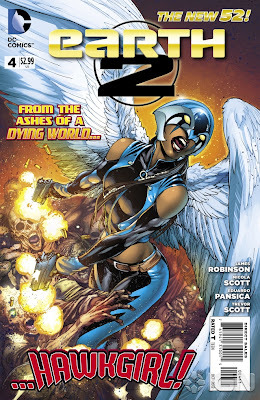 Earth 2 #4 - Our lovely as-yet-unnamed super-team is finally coming together this issue to stop the threat of Grundy, who is trashing the capital city in an attempt to draw out the Green Lantern and, well, rip his face from his skull. I guess he represents "The gray" and death and all that stuff and Green Lantern is powered by the planet's life-force (the green! I wonder if it's St. Patrick's 24/7?). 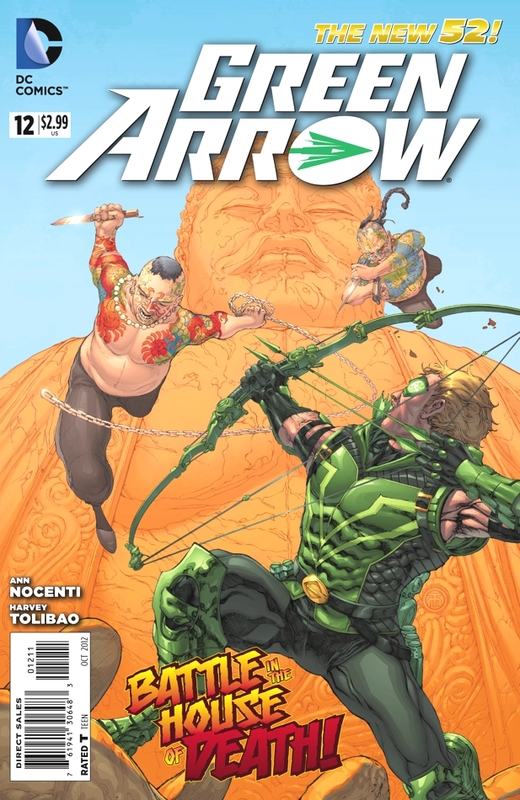 Green Arrow #12 - Oliver Queen has travelled to China to confront a rich "legitimate business owner" known as Fang, who has purchased the controlling stocks to his company and try and clean up the mess he's made of everything in the last 11 issues. Silly Green Arrow...high finance is for businessmen! Worlds' Finest #4 - Power Girl and Huntress have a final show-down with gigantic, nuclear-powered monster Hakkou in the Pacific Ocean off the coast of Tokyo! Of course nothing in life is ever easy as, even in the harbour, there are hundreds of civilians in boats, including an oil tanker that seems ripe to cause environmental catastrophe and of course some American ship that's also carrying nuclear missiles. Sounds like a walk in the park, right? 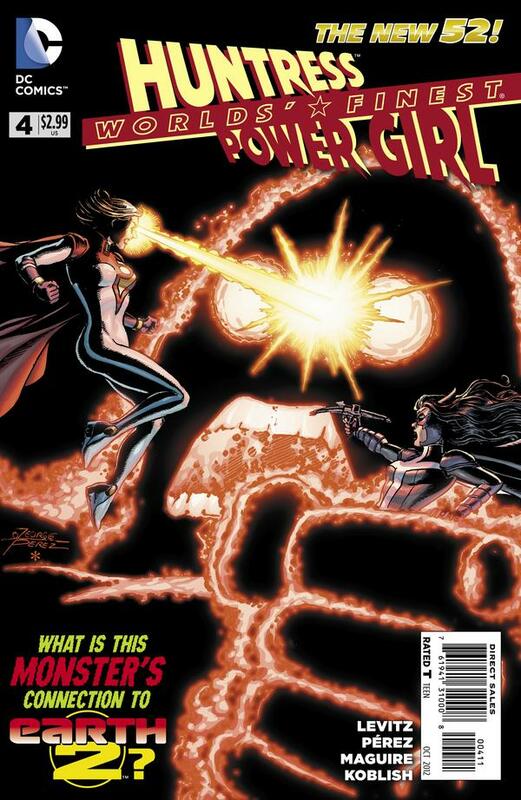 Unfortunately, Power Girl is still inexplicably being affected by all of this radiation! 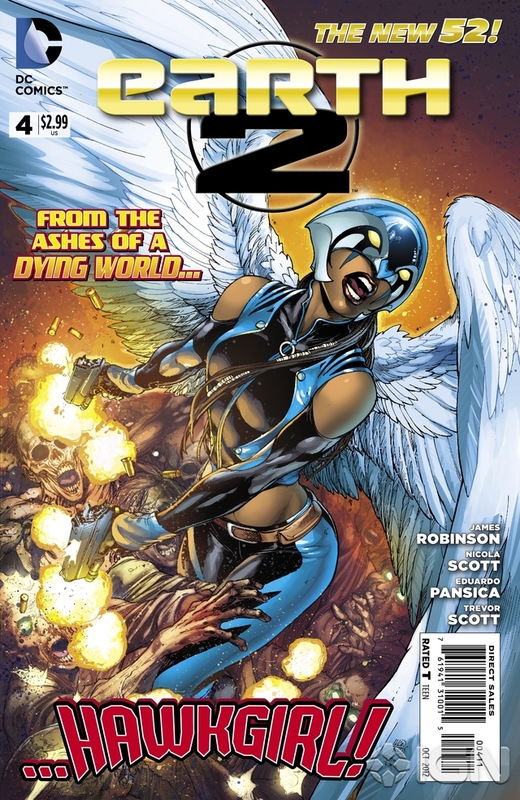 Just as inexplicably, Huntress, the supposedly normal human, is NOT! They don't know why and neither do we...regardless, humanity needs saving! ANNND...that's it first week of August! Go ahead and proceed into the future! And what a future it is, as tomorrow's New Comic Book day brings us Batman, Batgirl, Suicide Squad and More!! That's it! You're free! Go out and play! See ya next week!